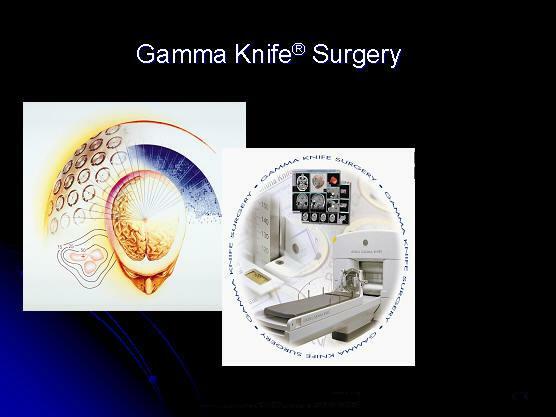 The Gamma Knife isn't really a knife at all, but radiosurgery - a non-invasive neurosurgical procedure that uses powerful doses of radiation to target and treat diseased brain tissue while leaving surrounding tissue intact. This state-of-the art technology allows physicians to operate on brain lesions often considered inoperable. Gamma Knife treatment offers new hope for patients with brain tumors, vascular malformations and Parkinson's Disease . The Gamma Knife isn't really a knife at all, but radiosurgery - a non-invasive neurosurgical procedure that uses powerful doses of radiation to target and treat diseased brain tissue while leaving surrounding tissue intact. This state-of-the art technology allows physicians to operate on brain lesions often considered inoperable. Gamma Knife treatment offers new hope for patients with brain tumors, vascular malformations and Parkinson's Disease.